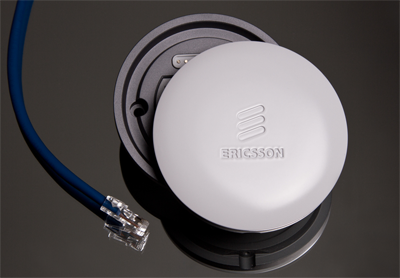 +Ericsson is looking to open up the small cell market with the introduction of its Radio Dot System, a disk-shaped remote antenna element about the size of a hockey puck. The Ericsson Radio Dot is connected via standard Category 5/6/7 Ethernet cabling to a indoor base station. The Dot delivers 3G and 4G LTE for indoor users using 2X 100 milliwatt output power. Up to 96 of the dots could be connected to a single base station. The compact dots can be mounted to ceilings or walls and use Power-over-Ethernet. As such, it serves as an alternative to distributed antenna systems (DAS) or single-element, broadband-connected femtocells. 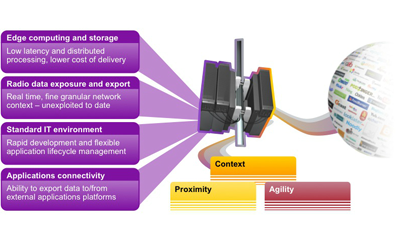 Ericsson said its unique Radio Dot System leverages the same technology in its macro base stations, including cell coordination and self-organizing networking capabilities. The company believes that the unit's small size and simplicity of installation will make it far easier and cheaper for carriers to deploy. The design incorporates 14 patents. Ericsson Radio Dot System supports integration with Ericsson's carrier Wi-Fi portfolio enabling features such as real-time traffic steering to ensure the best user experience across both Wi-Fi and 3GPP networks. Additional Wi-Fi capability, as well as multi-carrier / multi-frequency support are also planned. FDD-LTE is initially supported with TD-LTE versions on the way. Johan Wibergh, head of Ericsson Business Unit Networks, says: "With the Radio Dot System we lower the threshold to building indoor coverage. The dot is the most cost-effective, no-compromise solution to the indoor coverage challenges expressed by our customers. It is ultra-small but can scale to virtually unlimited capacity; it is easy to install, future proof and it is 100 percent integrated with existing mobile networks." Speaking at the Ericsson Analyst Forum in Santa Clara, California, Kris Rinne, Senior Vice President, Network and Product Planning, AT&T Services, said: "Small cells are a key component of AT&T's Project VIP network enhancement program as we seek to constantly improve our customers' mobile Internet experience. Delivering a great wireless experience indoors can present both technical and logistical challenges. A solution like the Ericsson Radio Dot System gives AT&T another tool to choose from in its next-generation toolkit." The product is expected to be commercially available in late 2014. 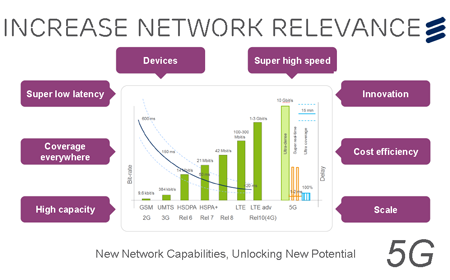 With 4G LTE rollouts now underway by dozens of operators worldwide, interest is building in what comes beyond the LTE-Advanced standards. Speaking at the Ericsson Analyst Forum in Santa Clara, California, Ulf Ewaldsson, Ericsson's CTO, said 5G is just a research concept at the moment and any vendor claims about having the technology in the labs is hype. 5G research projects underway in Europe and China are seeking to outline the requirements for 5G, not developing standards yet. Spectrum constraints are a reality that limits what can be practically deployed. So what does Ericsson think could be possible with 5G? Ewaldsson said don't expect 5G just to be a really fast radio specification. He envisions 5G as a suite of technologies for enabling the network society. Some things that might be achievable: 10 Gbps radios in the downlink, ultra-dense cells, extremely low latency at 1-2ms, end-to-end Quality of Experience control from the cloud to the device, and massive scale. 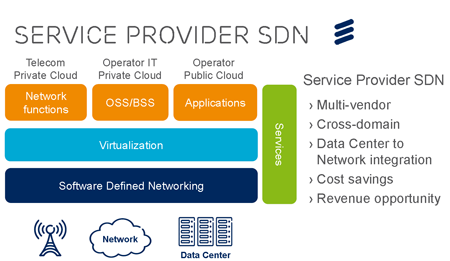 Ewaldsson would also like to see 5G as complementary technologies to existing networks, especially taking advantage of the programmability and virtualization currently being built into the next wave of cloud-enabled platforms. Ewaldsson said the timeline for 5G standardization suggests commercialization by around 2020, although many operators will want to leverage these technologies as they become available. Alcatel-Lucent's Nuage Networks venture has enhanced its Virtualized Services Platform (VSP) with a high performance gateway called the 7850 Virtualized Services Gateway (VSG) that provides an alternative for companies with a significant investment in non-virtualized assets who want to leverage automation and control across their virtualized and non-virtualized infrastructures. 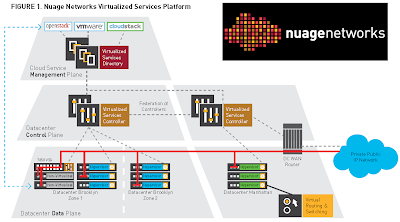 Nuage said its 7850 VSG allows CIOs to establish policies to be instantiated and enforced across all of the company’s assets, within and across private and shared data center facilities, regardless of whether the servers or appliances are virtualized. The 7850 VSG delivers a terabit of capacity in a single rack unit with full switching and routing capabilities. It provides a high-performance gateway for large multi-tenanted datacenter environments and colocation sites. The unit is currently in trials and is expected to be commercially available later this year (Q4 2013). "We are committed to removing the constraints that keep networks from being as dynamic, responsive and instantaneous as cloud applications need them to be. By offering the full range of options for seamlessly integrating bare metal appliances, we allow our customers to reap the benefits of automated and template-driven deployment of applications under a common policy driven framework across all their workloads. We are excited to have removed yet another key barrier," stated Sunil Khandekar, CEO of Nuage Networks. SK Telecom and Nokia Solutions and Networks are testing Liquid Applications over LTE. NSN defines Liquid Applications as those can take advantage of a base station's close proximity to end users to enhance the overall experience. At the heart of Liquid Applications is the Nokia Siemens Networks Radio Application Cloud Server (RACS), which integrates cloud technology and service creation capabilities, running on standard IT middleware, in the base station. After the installation of Liquid Applications into the SK Telecom laboratories at the end of June, testing was conducted during a three-month period, with a view to showing how Liquid Applications provided greater context for personalizing services and enabling the simple subscriber tariffs that SK Telecom offers for data-centric applications and services. NSN said successful testing was conducted with three advanced services over LTE: location-based mobile advertising, augmented reality and premium application delivery. “We are pleased to be working closely with our longstanding partner NSN on this proof-of-concept project. With Liquid Applications, we expect to create an enriched Service Aware RAN environment that brings greater benefits to our customers through intelligent and personalized services,” said Choi Jin-sung, executive vice president and head of ICT R&D Center of SK Telecom. SK Telecom and Nokia Solutions and Networks signed an agreement on February 27, 2013 during Mobile World Congress (MWC) 2013, to cooperate in the testing of Liquid Applications. The aim was to evaluate how effectively Liquid Applications would deliver a unique and personalized mobile broadband experience over LTE with applications, services and content located inside a mobile base station, in close proximity to the mobile subscriber. Brazilian carrier, OptiTel, is using +ADVA Optical Networking's FSP 3000 platform to to gradually develop a full agile core network that will include 100G transport, ROADM technology and a GMPLS control plane. 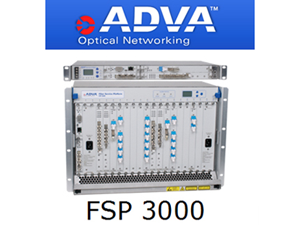 The ADVA FSP 3000 was selected for its single-fiber working (SFW), which is the ability to transmit and receive data on the same fiber. The network is being deployed by long-term partner Syncom Telecom Solutions. Financial terms were not disclosed. A key competitive advantage for OptiTel is its 4000km of fiber connecting the provinces of Rio Grande Do Sul, Santa Catarina, Paraná and São Paulo. The focus here is on corporate customers and the delivery of services to other carriers.